A two story house that was built in 1852 and moved to Kollsberg in 1949. The upper floor was originally used as a guest room or bedroom and as a reception room for large parties. Later, this part of the house was used exclusively as an elegant drawing room. The floor is now partly dedicated to Paul Piltz, a painter from Östra Ämtervik who became locally well-known. He lived near Torsby with his wife for many years, until he died in 1973. On the easel you can see an unfinished painting. The furniture in the drawing room was partly donated by Piltz and his wife. During the Christmas market on Saturday before Second Advent, the table is always set elegantly with a traditional ‘julbord’ (Christmas dinner). The ground floor consists of hall, kitchen and bedroom. In the hall, you can see a milk separator from the beginning of the 20th century. The kitchen is furnished, amongst others, with bunk beds in alcoves and a big locally produced cabinet. 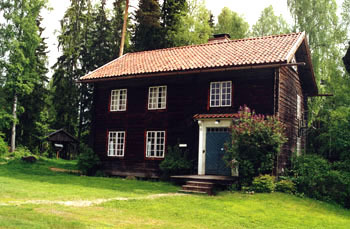 The stove is a Norwegian model dating from 1796.